OKLAHOMA CITY (AP) — Last postseason, Dirk Nowitzki and the Dallas Mavericks rode a wave of late-game comebacks to win the franchise's first NBA title. 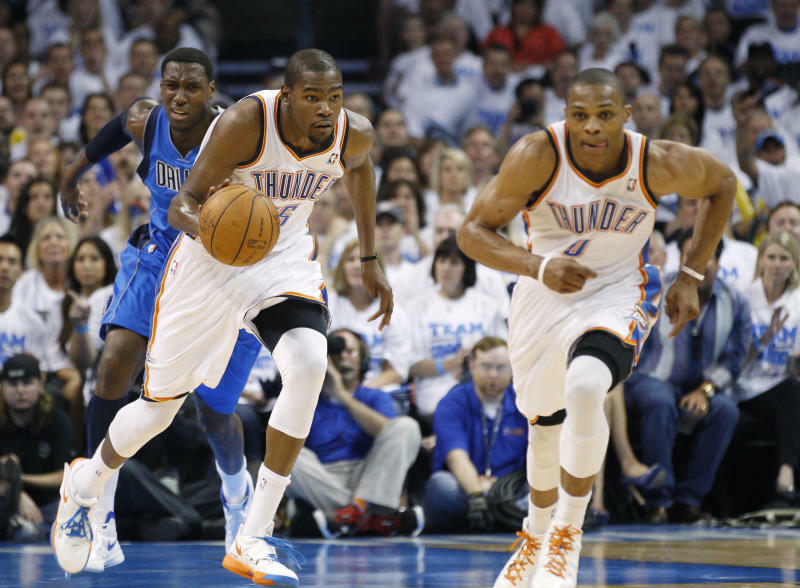 Now the Oklahoma City Thunder are showing the Mavs how it feels to be on the other side. Russell Westbrook scored 29 points, Kevin Durant added 26 in an off-shooting performance and Oklahoma City clawed out a 102-99 victory over Dallas on Monday night to take a 2-0 lead in their first-round Western Conference playoff series. The Mavericks led in the final minute in both road games so far, but couldn't even manage a split as the Thunder gutted out two wins by a total of four points. "We just haven't made enough plays. 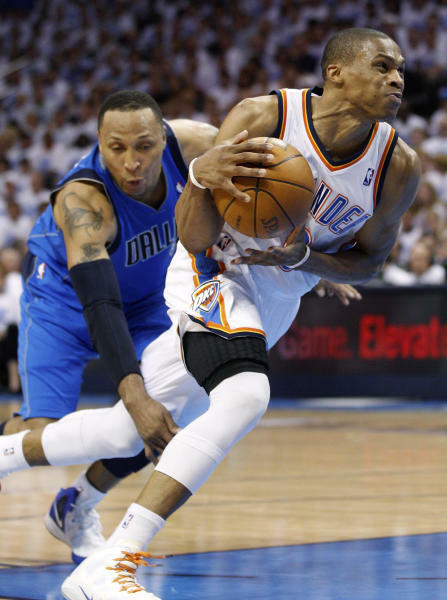 It is tough, there's no question about it," Mavericks coach Rick Carlisle said. "We've had opportunities and we haven't cashed in. They've made one more play than we have in both games. That's how playoff basketball is." Durant hit two free throws with 50.4 seconds left to give Oklahoma City a 98-97 lead, and reserve James Harden hit all four of his foul shots after that to close it out for the Thunder. Jason Terry missed two 3-point attempts from the left wing in the final 5 seconds that could have tied it and set up overtime. Instead, the defending champs head back home facing what amounts to a must-win Game 3 on Thursday night in Dallas. "That's really all we need right now is to get on the board on Thursday," said Nowitzki, who led Dallas with 31 points but missed both his shots in the final 75 seconds. "I still think the guys are upbeat, even though we're down 2-0. The guys know that we're right there. We're still in this if we get the game on Thursday." If not, the Thunder will take a big step toward avenging last year's 4-1 loss in the Western Conference finals. "Obviously, they have been here last year so they know what it takes," Harden said. "We've made it pretty far, so we know what it takes. "It's going to be a battle." Durant hit both foul shots, and Nowitzki missed his chance to answer with a fade-away 12-foot jumper from the left side. Harden, only eight days removed from sustaining a concussion as the result of elbow from Metta World Peace, grabbed the rebound on Nowitzki's shot and got fouled to set up the first of his four clinching free throws in the last 26 seconds. "That's what the playoffs are about," Westbrook said. "Toughness." The late-game struggles are exactly the opposite of last year's championship run, when the Mavs got two fourth-quarter rallies while sweeping the Los Angeles Lakers and closed out the Thunder with back-to-back comebacks from deficits of 15 and eight points in the fourth quarter. But it's a continuation of the regular-season series, when Dallas led in the final 3 minutes of both games in Oklahoma City and lost them both. "We're just a couple bounces away from being up 2-0," Nowitzki said. "It's tough and it's frustrating, but we're going to keep coming. We're not going to lay down. If they beat us, we're going to make them earn it." This one nearly came to blows. The tension escalated after Serge Ibaka tried to block Nowitzki's jumper midway through the first quarter and smacked him in the left eye on his follow-through, without getting called for a foul. Nowitzki hit another jumper along the baseline on Dallas' next possession before he got shoved in the back by Kendrick Perkins while jockeying for rebounding position on a made 3-pointer by Durant. Perkins followed Nowitzki for a few steps before Nowitzki bumped him away, and Perkins responded by taking a swing at Nowitzki's head with his open hand. Official Zach Zarba stepped in front of Perkins and backed him away, and both were assessed technical fouls. "He tried to bully me and I bullied back a little bit and talked about some stuff, and moved on," Nowitzki said. Perkins responded: "It's playoff basketball. There's grown men out here playing basketball and teams trying to advance. You're just out here playing. It's nothing to hurt nobody or nothing like that." The Thunder went on a run a few minutes later, scoring the final nine points of the first quarter — all within an 82-second span — and then carrying over the momentum to build a 46-30 lead with 5:55 left before halftime. When Nowitzki and Perkins finally got back on the court together, the Mavericks' All-Star exacted some revenge while getting his team back in the game. He went on a personal 10-2 run, with all of the points coming while he was matched up against Perkins, to get the deficit down to 50-47. "It's playoff basketball. It's physical. We don't like the cheap shots when they give them, and they don't like them if we give them. That's the nature of competition," Carlisle said. "I love hard-played, clean, competitive playoff series. You throw the ball up and may the best team win. "The dirty (stuff) has got to stop. We don't want anybody getting hurt out there, either way." Notes: After going back and forth responding to each other's comments on how Oklahoma City's defense on Nowitzki was officiated in Game 1, Oklahoma City coach Scott Brooks insisted any dispute with Carlisle wasn't personal. Years ago, the two roomed together while playing in the Continental Basketball Association. "He was a good roommate. He didn't snore," Brooks said. "That's all it takes. Buy me a meal every now and then and not snore, you're a perfect roommate." He later playfully retorted: "If you want it to be personal, I was a better player. How many years did I play in the league? How many years did he play? I played over a decade. He played three." ... Shawn Marion hadn't made a playoff 3-pointer since 2007 before making three in Game 1. He had another in Game 2. 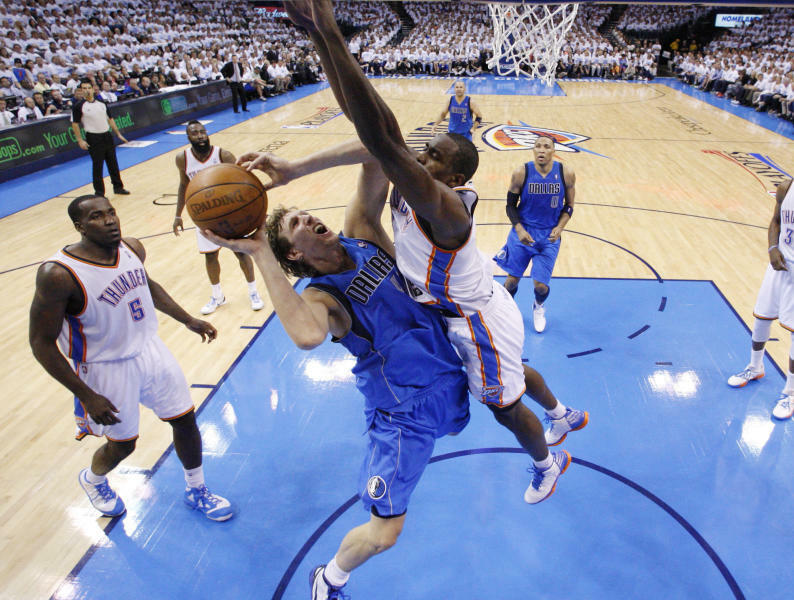 ... Ibaka, who tied his regular season best with 22 points in the first game, got into foul trouble and scored only two.